Let me be honest. I forgot about this blog. Wait. Wishing you a very happy new year. So, yeah, I have been running around to get the final stuff done for my book that is expected to be out in a couple of weeks. Yes, my book. No, not self published. So, yeah. But also, I wanted to start off writing this blog this year with a place that I loved. Not liked, not OK, not anything, but a place that I loved. So I waited. And then forgot! Sorry for the delay in updating. I know its been about 2 weeks! During the fag end of 2014, I had a craving for noodles. Now, that doesn't happen always. I crave for burgers, fries, waffles maybe, but noodles? Not so often! What do you do when you crave for noodles? I mean, a Chinese place maybe!?! But nope, not that kind. I wanted full bodied noodles with the works. We were driving past Go Go Ramen and the bulb went up in my brain! Bingo. What better place than a place dedicated to noodles? 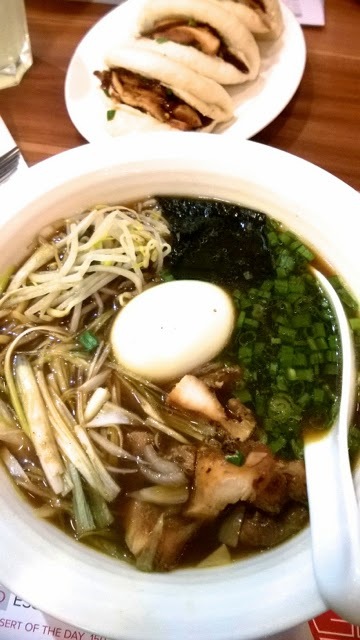 OK, I know Ramen is more than noodles, but my first experience there was amazing, at a time when they had only about 5 dishes on the menu. Location has changed, menu has expanded, and on a Tuesday evening, the 15 odd seater restaurant was packed. I was glad that one table was getting done and we got seated in about 3 minutes! I knew what I wanted but when I saw a new broth offering, a soy based broth with the grilled chicken, I decided to go for it. 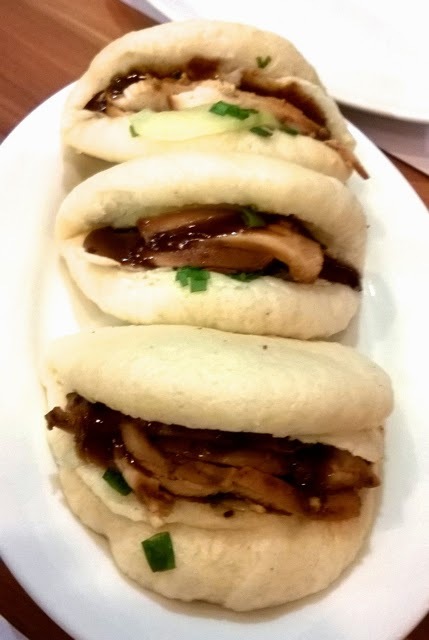 The grilled chicken stuffed buns. That's it! In a few minutes, the super large bowl of ramen was on my table. Full bodied. Noodles. Three large pieces of chicken. Lots of veggies. I mean, full bodied! Spoon in one hand, chop stick in the other and we slowly gnawed away! The super soft, super tasty, awesome stuffed buns, the only distraction. Broth. Noodles. Broth. Noodles. And on! Craving satisfied. Happy to see dessert on the menu. Last time, there wasn't any. A caramel something pudding. Slurp. Slurp. Slurp. It is amazing to see somebody take the risk and set up a very specialised cuisine in Chennai. Something as specific as Ramen. Even better to see that (at least that night), Chennai lap it up. 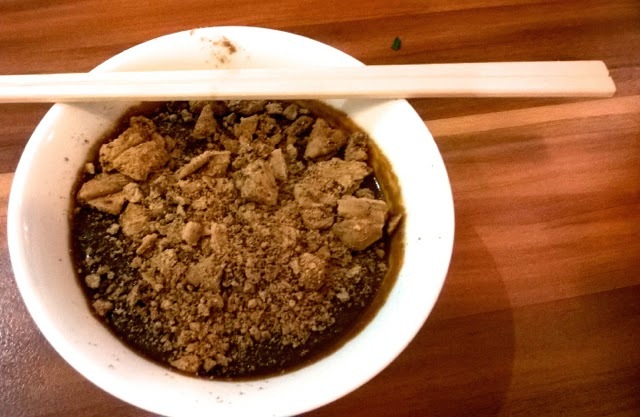 It is not your usual noodles. It is Ramen. Boat load of broth, huge portion of veggies and chicken. Not the shredded chicken that you can barely see or taste in most noodles, but chunks. 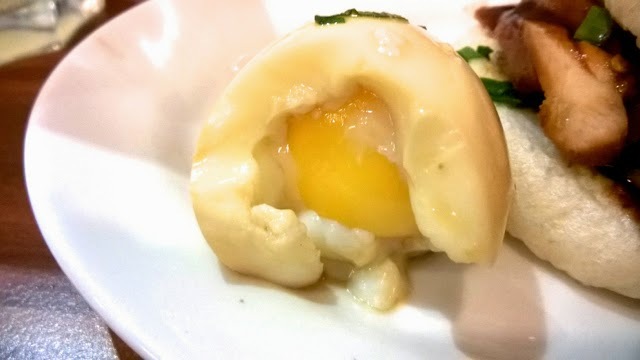 A perfectly boiled egg. I had to shoot and post the photo of the egg with the yellow perfectly cooked. The flavour of Japanese wasn't too strong and that maybe because I chose the soy broth and next time I am going to try the other broths! Ramen has shifted to TTK Road!!! !